As craft beer continues to gain popularity, more and more businesses are trying to cash in on the new demand. Anyone reading this has likely noticed beers from smaller breweries popping up in previous unlikely places like chain restaurants and big box discount stores. How can you, as the consumer, make sure you're spending your money on something you'll enjoy? Follow these five tips to buying better beer, and you'll never be disappointed by less than brewery fresh beer again. Packaged On or Expiration Date? Beer is a perishable food item, just like anything else you might buy at the grocery store. You wouldn't buy a gallon of milk without checking the date. Give your beer the same respect. Most breweries will put some kind of "packaged on" or "best by" date on their bottles and/or boxes to help consumers know they're getting fresh beer. Checking these dates isn't always easy though. Fresh Beer Only is a great site that helps take the mystery out of beer date codes. As a general rule of thumb, beer is freshest within 120 days of packaging. After that, it will likely not taste how the brewer intended. UV light makes beer "skunky" ! Beer has two mortal enemies. One of them is light. Most breweries do their best to package their beers in a way that will keep them free from light as much as possible. However, a lot of times, stores don't show the beer the same respect. If the beer is kept under bright florescent lights, its flavor might be affected through a process called "skunking". Green and clear bottles are especially susceptible to this. Brown bottles block most of the harmful light, and cans provide total protection from harmful UV light. "Skunked" or lightstruck beer smells just like it sounds: like a skunk. Obviously, this is not a good thing. The worst part is that beer can become lightstruck in a matter of minutes! Whenever possible, buy beer that isn't kept under bright UV lights, or at least grab yours from the back of the cooler where it is normally darker. Wet cardboard in your glass... Delicious! Not only is cold beer ready to drink when you buy it from the store, its freshness is also being helped by the colder temperature. Beer's second mortal enemy is oxygen. Brewers put a lot of effort into keeping oxygen out of their packaged beers, but inevitably some miniscule amount will find its way inside. Once it comes in contact with the beer, it starts the slow but steady process of making that beer stale. First, your hop aromas and flavors fade away. Next, your malt flavors become muddled, and finally you have a bottle of something that tastes kind of like wet cardboard. Warm temperatures speed up this oxidizing process. Beer that is shipped and stored cold will last longer than beer that is left to sit out on a warm shelf. Better beer stores will have plenty of cold storage for their beer or will work to keep the temperature of the entire store low to help slow oxidation. Also, keep in mind where the beer was before it was on that shelf. Many big box stores have storage areas or warehouses that aren't climate controlled. If they are receiving huge shipments of beer to a centralized location, it could spend months in a hot place before being moved to a cold refrigerator case. Do you think their beer is fresh? If you find your favorite specialty beer in a remote gas station in the middle of nowhere next to expired beef jerky and think it's your lucky day, take a moment of pause. How much of that beer do you think that gas station sells each month? Do you think they've kept it under the best conditions? The same goes for stores that offer a ridiculous variety of beers. Some do a very good job of monitoring their inventory to give consumers the freshest beer possible. Others just pride themselves on having a whole lot of stuff. Some of it might have been sitting there since the day they opened. Buying fresh delicious beer is a lot like buying anything else. Use common sense and you will get good results. Much like buying seafood, there are places you should and should not buy from no matter how appealing the offer might be. If you walk into the supermarket in July and see your favorite Christmas seasonal, it is not a wonderful treat from the beer gods. It is old beer. You shouldn't buy it any more than you should a container of egg nog that mysteriously winds up on the shelf at the same time of year. Follow these basic tips and you should be much happier with the beers you buy. Would you like to learn more about beer? Join BREW-ed for a Brewery & History Walking Tour . It's the middle of summer and many beer drinkers are turning to lighter more refreshing beers to beat the heat. One summertime favorite of many is the Hefeweizen, a light refreshing ale style that is a great thirst quencher on a summer day. Modern Hefeweizens have their origins in Bavaria, the region surrounding Munich in the southeast corner of Germany. Hefeweizen literally means "yeast wheat" and they are characterized by their cloudiness from still suspended yeast and their tartness from a large proportion of wheat used in the mash. Traditional German styles require at least 50% of the grain used in the beer to be wheat to be labelled a Hefeweizen, though American brewers aren't as restricted. Colorwise, Hefeweizens are typically a deep golden color with some showing light shades of orange. A separate beer style, the Dunkelweizen or "dark wheat," will range from deep copper to a muddy brown depending on the example. The aromas of Hefeweizens are reminiscent of banana and clove, though neither is used in the brewing process. Those characteristic aromas are natural byproducts of the yeast chosen by the brewery during fermentation. With respect to flavor, Hefeweizens are light on the palate, slightly tart from the use of wheat and can often carry the banana and clove aromas into the taste experience. They are often highly carbonated and leave the drinker refreshed and wanting more. 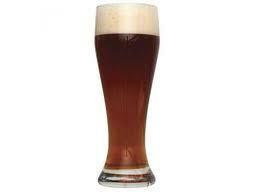 The traditional glassware for serving a Hefeweizen is called a vase and it very much looks like one. Personally, I've been known to use Hefeweizen vases to hold flowers on occasion and they do a fine job. The first noticeable trait of the glass is its size. It is considerably larger than a standard 16 oz pint and the reason for this is to allow for a beautiful layer of foam, or head, to rest on top of the beer. In the US, consumers often operate under a fear of being taken advantage of and expect a beer to be filled to the brim, When ordering a Hefeweizen it should be expected that at least two to three inches of foam will sit on top of your beer. I assure you that your bartender is not trying to pull one over on you. Next, you will notice the curvature of the glass. Hefeweizen glasses typically have narrow bases that open to larger bowls before tapering back in near the rim. The reason for the narrow base is to limit the transfer of heat from the drinker's hand to the beer. The wider bowl and slightly narrower rim allow aromas to be trapped in a way similar to a wine glass and also allow for great head retention. Without this inward taper, that beautiful layer of foam would quickly dissipate. So, the next time you're looking for a summer refresher, check out an authentic German Hefeweizen, and if you really want the full experience pour it into a vase.